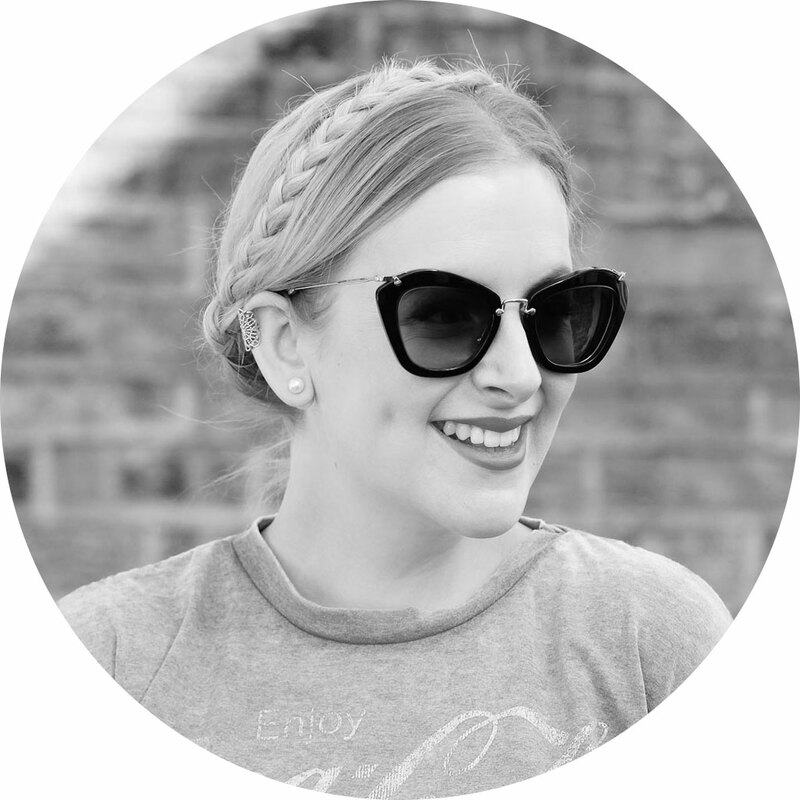 When I picked the Blush frames as part of my project with Swag & Stare, I was taking a slight leap of faith. They’re SO different from my usual spectacle style – I love dark, heavy frames that make a statement, whereas these make more of a whisper. 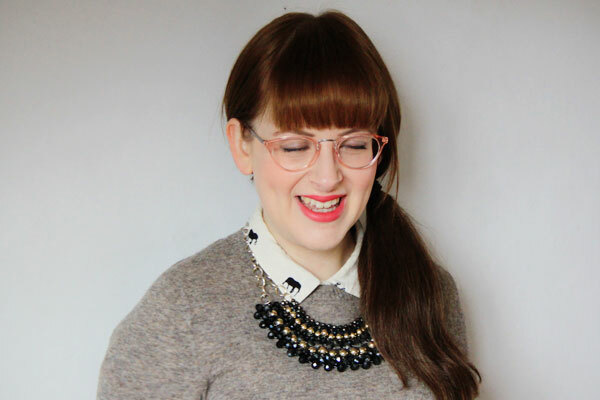 However, with an impending wedding and proof that the geek chic look really doesn’t work with a wedding dress, I’ve been searching for a lighter pair of glasses that won’t make me look like a maths teacher who’s fallen into the dressing up box. Apparently, brides with glasses are a rare breed. When I tell people I’m getting married, a popular response is ‘will you wear your glasses?’ Which just baffles me. I look like a completely different person without them – if it weren’t for the whole white-dress-and-veil get-up, I doubt most people would recognise me if I didn’t wear my glasses on my wedding day. So, the specs will be in place on 21st September. 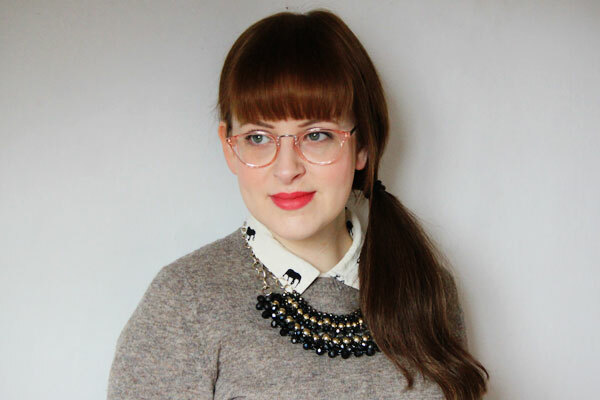 But I won’t be wearing my usual thick frames, and I think these delicate pink pretties are a great option. I want a pair that won’t overshadow my dress, will work with my vintage-style hair and makeup AND most importantly, will give my weakened eyes the boost I need to actually see my groom. Sadly the snow thwarted my plans to take any decent outfit shots with these specs – Rob did capture me throwing a huge hissy fit because of the sheet ice and snow drifts in March situation, but those photos really aren’t fit for public consumption. So you’ll have to use your imagination and picture me in a swingy spring dress and my favourite Viv Westwoods (c/o Sarenza), frolicking in lush grass with daffodils in my hair. Would you wear specs on your wedding day, fellow shortsighted friends? Yes! Love the shoes, are they the Lychee ones? Desperate for a pair and trying to decide what colour to get! When they told me to remove mine for my passport photo I was devastated. I look awful! You have to take them off for passport pic? I have to wear them all the time so a picture without them on isn’t me! Yep wore glasses on the day – I’ve got them on for my passport photo too! Wear them with pride, I say. Those specs are gorgeous! 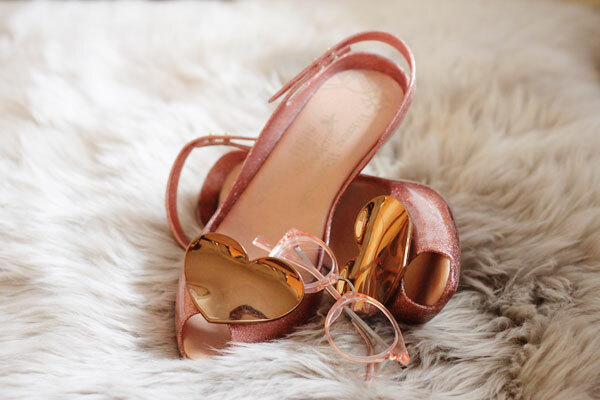 I was asked the same question when i got married….i am a lover of statement specs (currently rocking a fuchsia pink D&G pair) and i struggled with this decision for weeks, as most people attending knew me with glasses on. However when it came down to the hairstyle, tiara and jewellery glasses were just to much, especially the statement frames i love. Personally i am so glad i chose not to wear them – our photographer managed to get some gorgeous shots of me welling up which he wouldn’t have got with the specs. I think the right pair could look amazing and very individual. Can’t wait to see what you decide on. PS….. love, love. love the Vivienne’s – i ahve the same pair in gold and cream. I love the fact they match your shoes! I’d never dream of asking a bride to be who wears glasses on a full time basis whether they were going to change to contacts for a day. Love the blush option (and gorgeous pics with THOSE shoes! Swoon) really opens up your face. I love all the vintage glasses styles which are becoming popular now. If only I actually wore my glasses – I’m still at the opposite stage to you of preferring not to wear them except at the cinema! I think the daintiness of these would be cool for a wedding though. Those glasses look incredible on you, and I definitely support a bride wearing glasses, particularly when you look as good in them as you do! 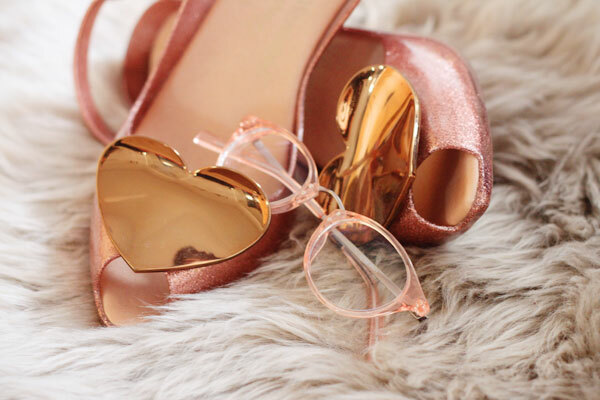 These are gorgeous glasses and I love how they pick up the colour of your shoes! Ho, your shoes are so pretty !!! Those are so cute! They will look just stunning with a wedding dress! nice post. i like shoes. thanks for sharing with us. Those glasses are gorgeous, and I can’t understand why people would ask if you will wear glasses or not! Those glasses look gorgeous on you Jen! Why would anyone think you wouldn’t wear your glasses on your big day? As a full time glasses wearer (even though I probably shouldn’t wear them as often as I do), I know that my glasses are a part of who I am and I look sooo different without them. I’ll definitely be wearing mine on my wedding day! Black and white so they’ll tie in nicely with my dress (white) and his suit (black). Although as a wedding photographers daughter/assisstant I don’t think I’ve seen any brides wearing glasses on their wedding day. Such a shame, brides should show off their glasses on their big day too! Grooms do it so why cant the brides? First off congrats on your wedding! I’m sure it will be beautiful and second thing, you should definetly wear your glasses! You look great with them and they are a part of you and if you feel comfortable with them no one should stop you. Love the shoes and the glasses. I am having the same debate to wear or not wear on wedding day. 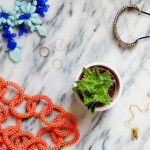 I love all of these rose gold accessories! Celebrate summer with Matalan and win £50!